1Palmer Physical Laboratory, Princeton University, Princeton, N. J. 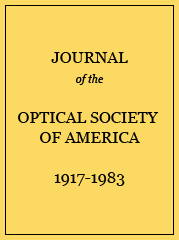 *Now with the American Cyanamid Company, Stamford, Conn.
A simple filtering system, involving the use of only two simply constructed selenium powder filters, is described, by the use of which it is possible to obtain a pure energy spectrum with a wire grating spectrometer in the region 40–130μ. In addition transmission curves are given for a number of substances in the regions 1–15μ and 35–130μ.